The European Commission said Thursday (21 August) that it was aware that a video reveals that room has been made at Bulgaria’s Varna harbour for pipes to be used for the construction of the South Stream gas pipeline, in spite of the assurances by the country’s government that the project has been frozen. A video published by Dnevnik, the EURACTIV partner in Bulgaria, shows workers at the Varna harbour amid pipes delivered for the South Stream pipeline, making room for further arrivals. According to Dnevnik, the first batch of pipes have arrived by sea on 14 August. They had been brought from Germany, as they were produced by the company Europipe. A caretaker government in Sofia, which took office on 6 August, has frozen the construction of South Stream, following clear indications from Brussels that the EU executive would impose infringements on Bulgaria, unless the country re-negotiates its bilateral agreement with Russia for the construction of the pipeline, which is in breach of EU law. Asked by EURACTIV to comment, Commission spokesperson Chantal Hughes said the EU executive was aware of the press reports and of the video in question. However, she added that the Commission assumed that construction was suspended, and that it was not going to comment on whether delivering pipes consisted of a violation. “We would expect that the construction is suspended as we have previously requested and the authorities have confirmed that they would do so”, Hughes said. 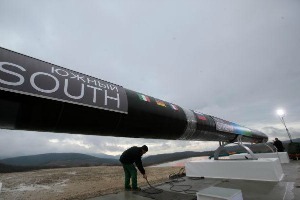 Hughes stated that regarding the Bulgarian section of South Stream, there was an infringement procedure ongoing which concerns the compatibility with EU public procurement rules of the pipeline in this country. Indeed, at the G7 summit held in Brussels on 4 June, Commission President José Manuel Barroso made it plain that the EU’s executive had launched an infringement procedure against Bulgaria for non-compliance with European rules on energy competition public procurements. Other infringements procedures related to other countries participating in the project (see background) would follow if other irregularities were not removed, he said. Hughes said the infringement procedure was “progressing” and that the Commission was analysing the reply of the Bulgarian authorities to the formal notice that it sent. “When we finish that analysis, we will decide on the next steps. You may recall that in the letter of formal notice, we requested the Bulgarian authorities to suspend the construction of the project until the alleged violations are remedied and we can be certain that there is full compliance with European law. The Bulgarian authorities have confirmed more than once that they agreed to suspend work,” she said. South Stream is a Russian sponsored natural gas pipeline. As planned, the pipeline would run under the Black Sea to Bulgaria, and continue through Serbia with two branches to Bosnia and Herzegovina and to Croatia. From Serbia the pipelines crosses Hungary and Slovenia before reaching Italy [see map]. Its planned capacity is 63 billion cubic metres per year (bcm/y). Last December, the Commission said that all bilateral agreements (IGAs) for the construction of South Stream are all in breach of EU law and need to be renegotiated from scratch [read more]. Dnevnik, the EURACTIV partner in Bulgaria: ????? : "???? ?????" ? ???? ?, ??????? ?? ???????? ?